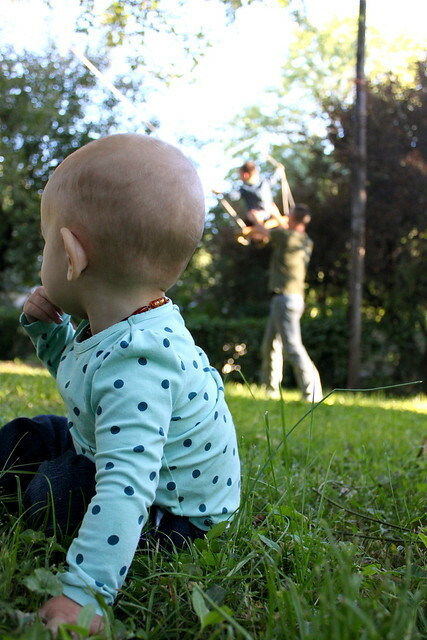 We had a rushed afternoon but managed to snag a few moments as a family in the backyard before the sun went down. I know I complain a lot about the snakes, mosquitos, poison ivy, lack of a fence, etc. but I'm going to take so many happy memories from this little plot of land when we move someday. I doubt we'll find such a large, shaded yard so easily again so I'm determined to enjoy everything it has to offer. Someday, I hope we will have another large oak tree (with a treehouse), a covered patio for summer dining, a large outdoor shed for storing projects that are waiting on me, and strings of outdoor lights near our restored Airstream trailer. Ahh, I've got simple dreams! What is your dream backyard? 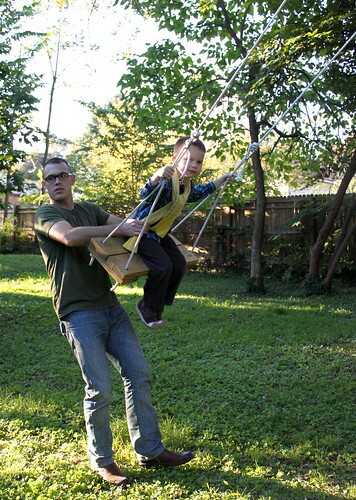 I'd love the swingset that is in my mom's backyard. It was my birthday present when I turned two years old and it puts most part sets to shame. 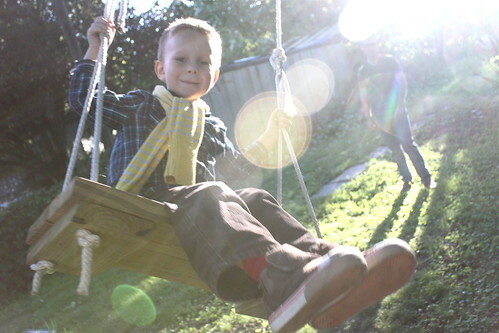 One day I will have swings. These pictures look so peaceful! Love them! I would wish to have a backyard at all, so you are a lucky girl :)! :) oh these photos are wonderful! So sweet! We spent the afternoon outside to leaf hunting! We're trying to get outside as much as we can now too...this weather is putting a spring in everyone's step, and the fresh air is doing us all loads of good! Looks like a fun time! Family time is the best! Oh, and can you share with us the tecnique/secret for photos in the sunlight that way? I've gotten 1 or 2 like that but they were purely on accident. I love the dreamy feel they give to a photo though that requires no editing. those are such happy fall photos. Now that we are apartment living, I am dreaming up big dreams for our own little outdoor space. I would be happy with a patio and twinkle lights and a nearby park. I would love a big house with a wrap around porch, and a big shady tree in the backyard for picnics. Oh and lots of room for my veggies! I've been a lurker for a while and I adore your blog! Those photos are perfect! 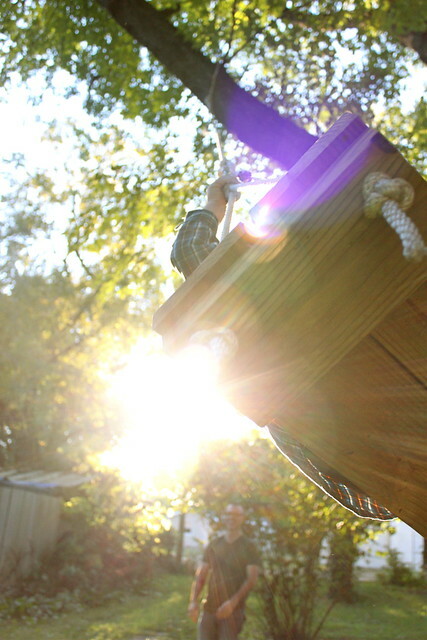 wood swings remind me of living in texas when I was a kid. great photos. A smaller yard, believe it or not. It's great but we just can't use it all. Plus when all my little man wants to do is eat grass and leaves it's not the most restful experience. Awww... I'm jealous of your backyard- even with it's "flaws." We own our house, but its part of a condo association....so we don't have our own yard to put a pretty swing in. Its beautiful Rachel! your family is so cute! i love reading your blog! A canopy is all I need. Ooo... I'm crazy about making my garden lovely! Currently it's all weeds and Aussie native trees, apart from the bits I've been working on. My dream is to have flowers EVERYWHERE, a gazebo and fish pond up the back with a big weeping mulberry tree next to it, vegetables and herbs coming out of my ears, and a big beautiful patio. Sigh.